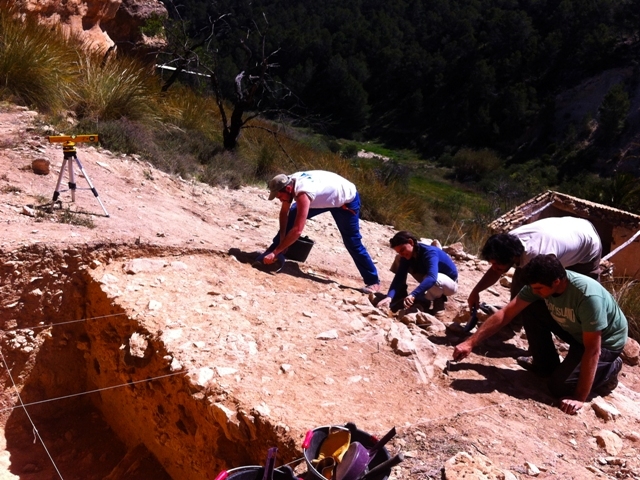 From April the 1st to April the 28th, an excavation is being held in the sites “Finca Doña Martina” y “La Boja”, both of them found in the area known as “Rambla Perea” near the murcian city of Mula. For one more year the aim of the project, directed by Joao Zilhao, is to add information about the Middle and Upper Paleolithic in Murcia Region. The rock shelters of Finca Doña Martina (FDM) y La Boja (ADB) present Upper Paleolithic sequences under excavation. FDM has an Epi-magdalenian level over a thick Upper Solutrean package, dated by radiocarbon technique to 23000 cal BP. This Solutrean level is separated from the bedrock under it by a unit with an archaeological content which is assigned, in a provisional way, to be Gravetian. ADB sequence starts with a possibly Upper Magdalenian level, which is followed by a thick sterile level on top of a solutrean sequence. At the base of a test pit that went down 2.5 metres below the surface, it was discovered a level rich in personal ornaments and lacking in backed elements, which is provisionally assigned to the Lower Solutrean on the basis of a radiocarbon date of ca. 25000 cal. BP.